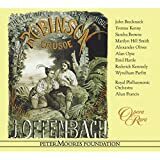 This 3-CD set offers Offenbach's fantastic opera, a favourite of the genre. Jeffrey Tate's full version of Les Contes de Hoffmann had the aim -- in his own words -- of getting as "close as we can to envisage the score and the drama that Offenbach conceived." With an unrivalled catalogue of over 450 complete opera recordings produced over the last 60 years -- and an illustrious succession of artists that today includes such names as Angela Gheorghiu, Natalie Dessay, Joyce DiDonato, Roberto Alagna, Antonio Pappano and Riccardo Muti -- EMI Classics, with its sister label Virgin Classics, can rightly claim to be the Home of Opera. This spring 13 timeless operas join the series including Bizet's Carmen, Mozart's Cos fan Tutte, and Donizetti's L'Eisir D'Amore. Among already available 60 opera releases -- essential sets produced since 1953 by EMI Classics and Virgin Classics -- are such all-time great recordings as Maria Callas in her first Tosca, Placido Domingo in Tristan und Isolde under Antonio Pappano, Lucie de Lammermoor, starring Natalie Dessay and Roberto Alagna, and Der Rosenkavalier, starring Elisabeth Schwarzkopf and conducted by Herbert von Karajan. Each CD multipack contains a 16-page booklet with introductions in English, German, French and Spanish and a bonus disc containing synopsis and libretto with translations.